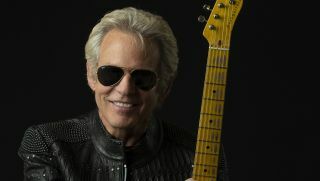 The former Eagles guitarist's star-studded upcoming album is out April 5. Did the Eagles Get the “Hotel California” Chords from Jethro Tull? "Maybe it’s just something that they picked up on subconsciously," Ian Anderson once said of the similarities between these two particular tunes. Release features the band's entire studio and live catalog, as well as b-sides, singles, videos and more. The Eagles have announced a 40th anniversary, deluxe reissue of their landmark 1976 album, Hotel California. An interesting 2017 version of the Eagles has announced a set of“An Evening with the Eagles” shows that will take placethis fall. Timothy B. Schmit first experienced commercial success as a teenager, when his band the New Breed had a hit in 1965 with "Green Eyed Woman." The 39th Annual Kennedy Center Honors aired on CBS December 27, 2016,celebrating James Taylor, Al Pacino, Mavis Staples, Argentine pianist Martha Argerichand the Eagles. Like a lot of music-obsessed people, I tend to create a fair amount of iTunes playlists. Why? So that I always have just the right music for any setting or situation. Check out thisjust-released video of an exciting and comprehensive discussion on the making of the Eagles' "Hotel California." Guitar World rounds up the top 20 Eagles tracks and breaks them down in an effort to provide some insight into what made this legendary guitar ensemble soar to great heights. Don Henley on The Eagles: "I Don't Think You'll See Us Performing Again"
During a recent interview with BBC Radio 2's Simon Mayo, Don Henley pretty much announced the end of the Eagles. Hear Isolated Guitar Tracks from Eagles' "Hotel California"
Here's one that's been making the rounds lately.It's the isolated guitar tracks from the Eagles' "Hotel California."